In case you missed out on last month, we have a special going on this month. Enroll in Ribbon Club now and begin with the August and September assortments shipped together for only $17.00 for US subscriptions. Subsequent shipments will be billed at $9.00 each. With this winning combination you will have a great ribbon collection to use on all your Autumn projects! What is your all time favorite Halloween candy? (or if you don't celebrate Halloween, what is your favorite candy? I remember as a kid dumping out my loot with my friends after a successful afternoon of trick-or-treating to see what yummy treasures we collected. Such fun! Our winner will be selected from the numbered comments on this post on Thursday, 9/17. Be sure to check back on Thursday evening to see if you are our lucky winner. All of the designers did a great job! I know this will sound "corney" but my favorite Halloween candy is Candy Corn:) Fantastic ribbon assortment-thanks for the chance to win it! The designers did an awesome job with so much talent going on! My favorite candy is snickers!!! Snicker snicker boo! Fabulous showcase once again what a clever lot the DT are,but guess thats why they are the DT. I don't really do candy as am more of a savoury person but I do love to mess and make candy and my favpourite things to make at the moment are tempered chocolate, cinder toffee and marshmallows which I am told are so much better and so different to bought ones in fact my son will nolonger eat bought marshmallow as he says by comparison to homemade bought are quite rubbery and dense to eat.Thanks for the chance to win the pretty ribbons too. it's funny you ask about Halloween candy, as we were talking about this just last weekend here at my house! I always 'secretly' nabbed the Tootsie Rolls from my sons' trick or treat candy stash when they were little. as they grew up, they just automatically gave them to me! tee hee! 2nd place goes to Nerds. especially those little bitty boxes of them. So fun! By far my favorite candy is Candy corn, but I only eat them during the Halloween season! Candy corn is the all time best. All the cards were great. Fun to see them all. The Design Team did a wonder job with their cards. 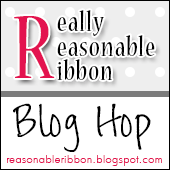 Very clever and wonderful techniques on ways to use ribbon in so many different ways. We appreciate sharing their wonderful cards to all of use. I love any candy with chocolate and nuts. I would always come back afterwards with a pillow case of candy when living in a large town. We would stay out until the lights on the porches would go out. Now living in the country, I go to town to give my grand children special made cards and treats. Of course, each card has beautiful creative ribbons. This years, I might just make the girls a Halloween bows for their hair like one of the designers did for her girl. Great hop, again! I love chocolate...my favorite candy is peanut butter cups!!! Love love love these projects for the hop. I am such a candy head. I love Reese peanut butter cups, snickers, smarties and Swedish fish. The designers were so creative and inspiring with their gorgeous fall creations! Thank you for the great hop. My favorite Halloween candy is a caramel apple! Loved the hop and I love Halloween! My favorite candy of all time is the Snickers bar, be it Bites, Fun Size or full bars! But, at Halloween, I can't resist buying a bag of candy corn and eating it until I'm sick!!! All the cards and projects were wonderful and great to see. My favorite Halloween candy is Snickers mini size bars or Peanut Butter Cups - I couldn't decide. No matter how you look at it....fall is my favorite season. The designers are so talented....I love to see everyone's creations. My favorite Howl-o-ween candies are caramel apple suckers...a hard green apple candy with soft gooey caramel in the center...and almond Snickers...Yum, yum! My favorite Halloween candy is candy corns. I remember using them for teeth as a kid. It was also fun to bite off each color and try to decide if each one tasted different :) This is my first time looking at this site. So glad I found it! Thanks to Karen Letchworth at My Cup Runneth Over for the link and lead!